Dawkins and Sabbatelli started off the match. Dawkins connected with a shoulder tackle and tagged in Montez Ford. Dawkins and Ford Dropkicked Moss out of the ring. Sabbatelli clubbed Ford in the back of the head and then tagged in Moss who had made his way back to the ring apron. Moss planted Ford with a Belly to Back Suplex and then posed for the crowd. Sabbatelli was tagged back in and continued the beatdown of Ford. Sabbatelli took a break to mock Dawkins on the ring apron. Ford leaped across the ring and tagged in Dawkins. Sabbatelli got distracted by Ford on the ring apron. Tino knocked Ford off the ring around but turned around into a big time punch from Dawkins for the pinfall victory. Lars trapped Mendoza in the corner and connected with a massive Splash. Sullivan followed it up with a ridiculous Powerslam and then stood over Mendoza. Lars lifted Mendoza up by his head and bashed him in the face several times. Sullivan then slammed Mendoza to the mat and covered him for the easy victory. After the match, Lars grabbed Mendoza again but Kassius Ohno came down to the ring. Lars laughed in Ohno’s face and left the ring. Sullivan and Ohno will battle at NXT TakeOver: WarGames this Saturday night. Gargano was shown backstage with NXT GM William Regal. Johnny Gargano versus Pete Dunne for the UK Championship was announced for next week. Moon and Martinez locked up to start off the match. Martinez got the upper-hand and applied a Headlock. Moon broke free but Martinez knocked her to the canvas with a shoulder tackle. Martinez locked in another Headlock on the mat in the middle of the ring. The crowd cheered Moon on as she powered to her feet. Martinez broke the hold and punched Moon in the face. Ember responded with a boot to Martinez’s face. Ember connected with a Dropkick for a two count. Moon launched Martinez into the turnbuckle and hit a Clothesline. Moon charged at Martinez but Mercedes was ready and planted Ember with a Spinebuster for a two count as NXT went to a commercial break. When NXT returned, Moon went for a roll-up but Martinez kicked out at two. Moon missed with a kick and Martinez hit a chop that echoed throughout the arena. Moon fell to the mat in pain and Martinez picked Ember back up and planted her with a Suplex. Martinez didn’t let go and followed it up with two more Suplexes for a two count. Mercedes went for another Suplex but Moon blocked it and connected with an Enziguri. Moon followed it up with a Hurricanrana then sent Martinez out of the ring. Ember then hit a Suicide Dive as the crowd chanted “NXT!”. The action returned to the ring and Moon climbed up to the top rope. Martinez got back up and booted Ember in the face. Martinez connected with the Tower of London for a two count. Martinez quickly went for another cover but Moon kicked out again. Martinez went for another Suplex but Moon reversed it into a roll-up for a two count. Martinez got tangled up in the ropes and Moon connected with a knee that knocked Mercedes to the canvas. Moon then hit the Eclipse for the pinfall victory. After the match, Nikki Cross, Peyton Royce and Kairi Sane appeared as Moon stood in the ring. Those four Superstars will compete for the vacant NXT Women’s Championship in a Fatal 4-Way match at NXT TakeOver: Wargames. NXT Champion Drew McIntyre came down to the ring. McIntyre grabbed the microphone and congratulated Almas on getting his title shot at NXT TakeOver: Wargames. McIntyre said that Almas and Vega are now in trouble. McIntyre wondered if Almas was ready for the big stage at WarGames. Drew then challenged Andrade “Cien” Almas to come down to the ring and face him like a man. McIntyre joked that Zelina Vega may not let Almas off the her leash for the night. Zelina Vega then came down to the entrance ramp and twirled her hair while staring at McIntyre. Almas finally joined her and he quickly took off his suit jacket and charged the ring. McIntyre took off his shirt and launched it into the crowd. McIntyre and Almas traded shots as Vega climbed up to the top rope. Vega leaped onto to McIntyre but Drew caught her. Almas chop-blocked McIntyre in the knee and then planted him with the Hammerlock DDT. Vega then grabbed the NXT Championship and shouted at Almas that the title will be his. Vega then tossed the title on top of McIntyre and exited the ring with Almas. 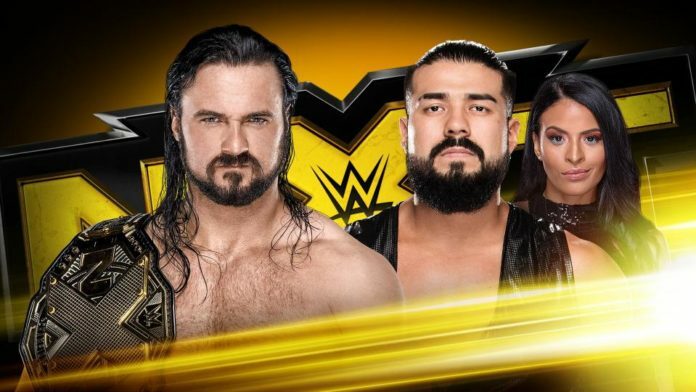 Drew McIntyre will defend his NXT Championship against Andrade “Cien” Almas this Saturday at NXT TakeOver: WarGames.